London's River Thames has become Wi-Fi enabled. A new initiative allows surfers (of the web, rather than the water kind) to go online anywhere along a 14-mile stretch of the river. Anyone with a wireless device can receive uninterrupted access using the hot-spot, which stretches from the Millennium Dome in Greenwich up to the Houses of Parliament at Millbank. The wireless zone will be extended further over the next two months. 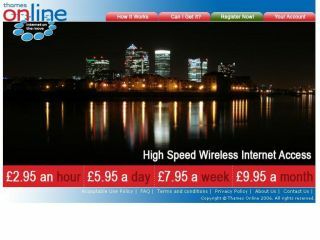 The Thames Online wireless network is available to anyone to use, and costs £2.95 per hour, £5.95 per day, £7.95 for a week or £9.95 for a month. It uses mesh networking technology across 100 access points, allowing users to move along the river without suffering disruption to their internet connection. The Thames Online network is also being used for GPS tracking of river traffic and wireless CCTV surveillance. The technology used in the network comes from codeCreation and Meshopper Wi-Fi Networks , whilst the network access points were supplied by Proxim Wireless . The main source of revenue will be generated by subscriptions from businesses, local government and emergency services, as well as use by tourists and other temporary users, said Nigel Wesley, CEO of Global Reach Group - the parent company of codeCreation and Meshopper Wi-Fi Networks.